It is an impressive sight to serve for the beginning of Once On This Island, and it creates a bit of timely realism for the 1990 musical by the composing team of Stephen Flaherty (music) and Lynn Ahrens (book and lyrics) that is all about survival, magic and believing. This team has compiled a significant and admired canon of musical theater compositions since they hit the big time on Broadway more than twenty-five years ago with Once On This Island. While some of their subsequent collaborations (Ragtime , Anastasia and Seusical) have earned them accolades and awards and maintained relatively high profiles over the years, Once On This Island has been a recurring favorite at regional theaters. Based on the novel My Love, My Love by Rosa Guy, this newly imagined and exuberantly performed revival is set on an island in the French Antilles. It tells a bittersweet, semi-tragic love story that involves bigotry and the racial divide between the dark skinned natives and the light-skinned mulatto land owners. Director Arden, choreographer Camille A. Brown and the design team have made sure we remain captivated by their ever changing vision of the island, the sheer magic of the stagecraft they deploy — along with the invigorating pulse of the score's calypso beat that is totally in synch with that tradition. The new orchestrations by Annmarie Milazzo & Michael Starobin, as played by musicians perched on high are worthy of praise, not the least for not assaulting our senses. 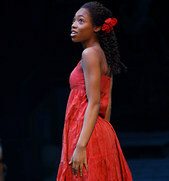 This, as the entrancing music embraces the uncomplicated story of a poor native orphan girl Ti Moune (Hailey Kilgore making her Broadway debut), who becomes hopelessly infatuated with the unattainable Daniel (Isaac Powell, another terrific Broadway debut) the aristocratic son a wealthy mulatto land owner. This is a musical that asks us to succumb to the quaintness of the story without losing sight of its moral: that love never dies but is merely transformed by its power. The musical numbers (see song list below) are mostly distinguished by their tropical island-inspired flavors. . . which is enough. And they land appealingly, thanks to the strong performances by a notably personality-driven company. It doesn't take long for the immediately endearing 18-year-old Kilgore to win our hearts as the love-intoxicated if also ill-fated Ti-Moune who is destined to become a folkloric legend among her people. Her sparkling singing voice is as winning as is her dancing, particularly when unleashed shoeless at a snobby aristocratic dinner party. Kenita R. Miller and Philip Boykin are delightful as the caring and protective couple who have raised the orphaned Ti Moune rescued as an infant from the sea. Lea Salonga doesn't have much to do as Ti-Moune's personal guardian, the Goddess of Love Erzulie, but she meanders gracefully through the often misty proceedings in a flowing white gown and a glittering silver crown on her head. The beauty of her singing voice has not diminished since she played the title role in Miss Saigon in 1991 at the age of 18. She is but one of the many gods and goddesses who rule the islanders and manipulate their fates. Much of musical's sung-through narrative thread is supplied by a bevy of storytellers. The colorful costumes designed by Clint Ramos earnestly reflect the rags, the riches as well as the many fantastical elements that co-exist on this island. They receive a little extra dazzle in the glow of the lighting designs by Jules Fisher & Peggy Eisenhauer. This musical may be small in its scope, but when compared to some, it achieves its own sense of grandness by being both magical and seductive— an unbeatable combination.